How the French celebrate Armistice Day is not very different from how other nations celebrate this solemn holiday. Armistice Day, celebrated on November 11, marks the end of World War I. Originally a day to honor those who had served in the first World War, the day became a way to remember all who served and died to preserve France in various wars. French Armistice Day is a solemn occasion. Like other holidays, most French people have the day off. Several rites, rituals and symbols honor the fallen. In France, as in many other nations, at precisely 11 o'clock in the morning on the 11th day of the 11th month (November 11), the nation pauses for a moment of silence. During this time, people reflect on the many sacrifices made by the brave men and women who fought in France's wars and who died for their country. Many rites and rituals are held at the great French battlefields. In 2008, for example, French President Nicolas Sarkozy held an international Armistice Day celebration at the Fort of Douaumont. This is where the battle of Verdun took place. Verdun was one of the most grueling battles, lasting ten months. Over 550,000 French soldiers died in that battle. Each solemn ceremony may be slightly different. Soldiers dressed in formal military attire may march in parade formation. Only a handful of French World War I veterans remain alive, and since many of these men are into their late nineties or older, few participate. Veterans that fought in other wars, such as World War II, may participate as well. Ceremonies throughout France may also take place at war memorials. These statues or memorials are scattered in towns throughout France. Flowers, wreaths, and special garlands may be left to remember the fallen. The red poppy symbolizes veterans in many countries, including France and America. The use of the poppy as a symbol to mark the dead comes from a poem by John McCrae entitled, In Flanders Field. McCrae was a Canadian doctor treating the wounded at Ypres. After burying his best friend, he sat down and began pouring out his grief about the war in his poem. He noticed red poppies, common in France and Belgium, blooming in ditches near the horrible battlefield, and he incorporated poppy symbolism into his poem. 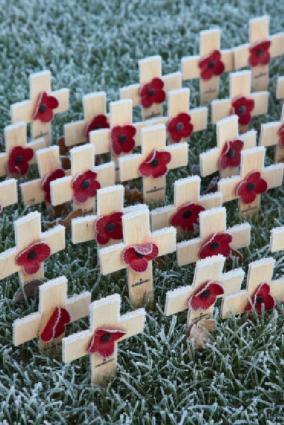 Today, poppies may be worn or placed on grave sites of veterans to commemorate veterans on Armistice Day. While Ypres is a Belgian town and not a French town, it was the site of fierce battles between the Germans and the Allies. It also marks the place where the Germans used poison gas against the Allies for the first time. Today, France seeks to take the lead in reminding the world that the historical differences among European nations that led to events such as World Wars I and II are over and done with. President Sarkozy, in his speech delivered at the 2008 Armistice Day gathering at Verdun, sought to emphasize that 90 days after the great battle, the enemies of Europe now gather as friends. To underscore his point, he invited not only former Allies, such as Britain represented by Prince Charles and Duchess Camilla of Cornwall, but the President of the German senate. The dignitaries stood shoulder to shoulder, representing the solidarity of the new European Union. Today, because Armistice Day is a national holiday, most people spend their free day with family. They may gather for quiet visits, lunch or dinner. Usually the day is spent in the company of family and friends so that one may remember the connection with the past. Many French families reminisce about members who served in France's wars. Photo albums may be passed around, memorabilia shared, or elderly relatives pressed to recount tales of their service. How the French celebrate Armistice Day is by marking the day with family, friends, and memories of those who went before and made the ultimate sacrifice to preserve their country.